At Your Gate brand ambassador Andrea Fuhrmann. The on-demand economy serviced by Amazon Prime, Postmates and Uber no longer cuts off curbside at the airport. In San Diego, Newark and three soon-to-be-announced U.S. airports there’s a new cell phone app that lets travelers have food delivered to them throughout the terminals. Brand ambassadors for the At Your Gate app go through security background checks so they can pass through airport TSA PreCheck lines with food orders. They can even enter an airplane to deliver food, snacks or other retail items right to a customer’s seat. Fuhrmann smiles at the recollection. 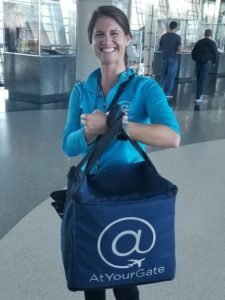 Dressed in a company-branded teal shirt, yoga pants and shiny sneakers, the 30-something former soccer player says she covers an average of more than 10 miles a day making deliveries at San Diego International Airport. At Your Gate co-founder and president David Henninger. At Your Gate premiered in San Diego on January 31, 2018. To date, the app has been downloaded 15,000 times and has delivered 9,000 orders, with about 1,000 of those orders occurring in Newark, where the app more recently rolled out, through an initiative of the Port Authority of New York and New Jersey. Watch for this niche to start filling up quickly. Similar service Airport Sherpa is up and running in Baltimore/Washington Marshall International Airport. And Grab, available in about two dozen airports worldwide, allows travelers to pre-order from restaurants and skip lines to pick up food themselves. 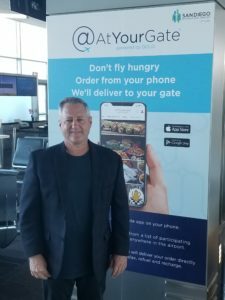 At Your Gate co-founder and president David Henninger says his app is on the brink of rolling out in two major East Coast airlines and one big Midwest hub before the end of 2018. Under Henninger’s eye, I conducted a test. From Gate 33 in San Diego airport’s Terminal Two, we placed an order via the app at precisely 4 p.m. Less than 12 minutes later, Fuhrmann showed up carrying an insulated delivery bag containing a still-warm turkey-and-brie panini from Camden Food Co.
My order was random, but this experiment wasn’t conducted in pristine laboratory conditions: It was a slow time of day, Camden Food Co. is also in Terminal Two and Fuhrmann knew a reporter was going to test the system. Still, having a panini delivered to an airport gate in 12 minutes is an impressive feat. “People are always amazed when we show up,” Fuhrmann says. Artisan Market at San Diego International Airport. 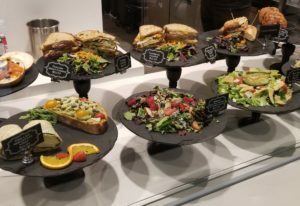 At San Diego’s airport, along with Qdoba and Camden, restaurants that have partnered with At Your Gate include Pacifica Breeze Café, Jack in the Box, Artisan Market, Saffron Thai and Panda Express. Those popular dessert treats from Donut Bar are also available. Besides delivering restaurant orders, At Your Gate can bring snacks, t-shirts or knickknacks from the CNBC News store, or cosmetics from MAC. Negotiations to include more restaurant and retail outlets in San Diego are underway. For now, liquids can’t be transported through security lines—though you can get a coffee delivered from a shop that’s located in your terminal. Who’s using the app? Mostly the same people who participate in the on-demand economy—Millennials and tech-savvy business travelers. But Henninger says families with kids are also giving it a try. And airport workers with limited time for lunch breaks have been quick to adopt the system. The most prolific At Your Gate customer is a Delta ticket agent who has placed 60 orders through the app, most of the time for a Caesar’s salad and a Sprite from Artisan Market. 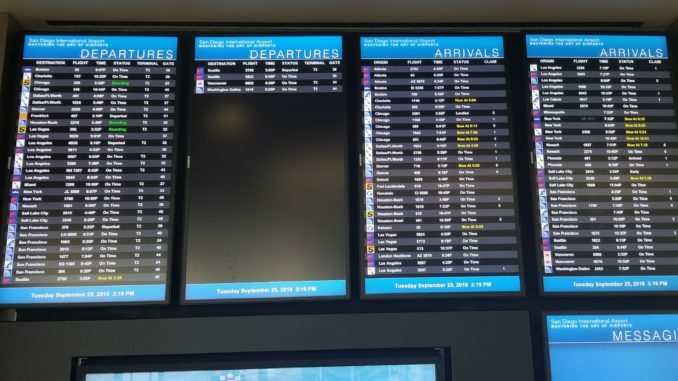 Henninger notes that if Southwest Airlines is experiencing flight delays they will sometimes make gate announcements that the app is available. And he says there have been at least three instances where passengers have boarded cross-country flights on JetBlue that were delayed, and the captain went on the PA system and talked up At The Gate. “In one of those cases, we had 30 people download the app and we delivered 30 orders onto a JetBlue plane,” Henninger says. 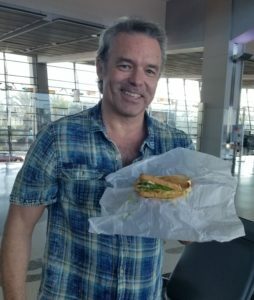 Ron Donoho with his turkey-and-brie panini. Tarmac delays notwithstanding, would an organized traveler really need to have their food delivered to their gate? For instance, what if you already strive to arrive early at the airport to get through security, eat something pre-flight and also pick up some “emergency food” to carry on the plane?